The problem on semi-globally stabilization has been addressed on a null controllable region for a linear system with saturating actuators . A technique for estimating the DoA has been proposed for discrete-time and continuous-time systems subject to actuator saturation . Semi-global stabilization has been shown to design a feedback law such that the DoA includes a priori given subset on the null controllable region . 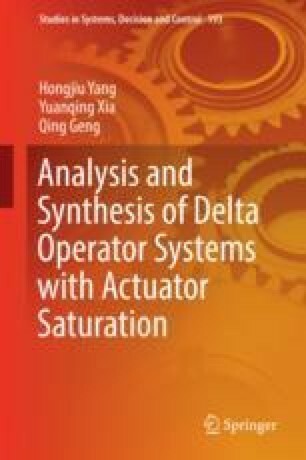 A stabilizing feedback law has been constructed for semi-global stabilization of the DoA with actuator saturation . It is well known that asymptotic null controllability with bounded controls is equivalent to a usual notion of linear stability plus an added condition that open-loop eigenvalues have nonpositive real parts.